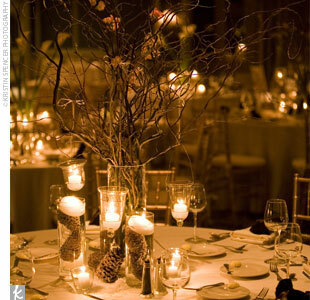 Winter wedding centrepieces can exude romance and richness without draining the bank account. Besides, who wants to spend their wedding budget on something that will only be used once? Here are four variations of inexpensive yet classic ways to do-it-yourself. 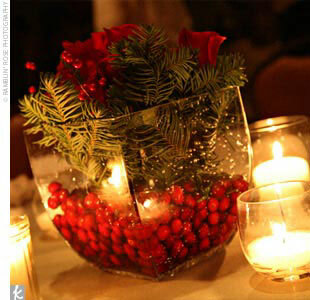 This centrepiece is ideal for a winter wedding, and while it looks expensive, is far from. Fill vases with water and branches from your yard, a nursery, or use artificial ones. It's hard to distinguish between real or artificial branches and pinecones, and besides, who's looking that close anyway? Candles from a dollar store or IKEA are inexpensive and ideal. This is building off the branch idea. Take a can of artificial snow and spray the branches lightly, allowing some of the deep brown colors to show. 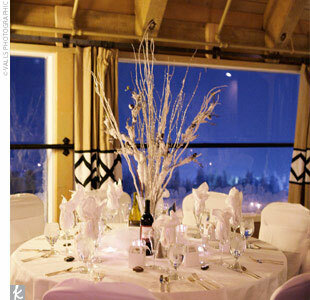 This gives off a freshly snowed on appearance, and white on white gives a clean romantic look. Tea lights floating in vases finish it off. If you want more color, add some deep red or burgundy candles to the table. If your wedding is during the holiday season, green and red are classic colors. IKEA has great cheap vases, and the fillings are more than affordable. Cranberries add rich color to an otherwise white table, and pine leaves can be found at a florist or in your backyard depending where you live. Dig in your old Christmas decoration boxes and get creative! If you have some extra cash buy some poinsettias or roses. Artificial flowers, depending on what kind, look like the real thing these days, and if it is an evening reception a candlelit table will hide the synthetic details. This could be a cheap and exquisite way to decorate a table. Beads found at a craft or dollar store are glued to a simple white vase. Alternatively, you could use colored beads and white flowers to fill. You don't have to stick to roses either. 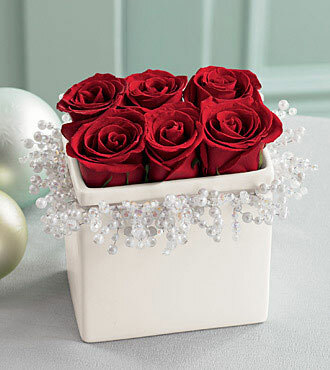 Add some greenery and poinsettias for more color, or any other flower that is inexpensive and seasonal. Baby's breath is a great filler! The key to making centrepieces is creativity. Play with different colors and textures. Try creating a table at home and take pictures of the different combinations. You can reference them later and share your ideas with friends. Remember: cheap does not have to look "cheap!"